To more broadly understand public attitudes toward algorithms in this context, the survey asked respondents a series of questions about the content they see on social media, the emotions that content arouses, and their overall comfort level with these sites using their data to serve them different types of information. And like the questions around the impact of algorithms discussed in the preceding chapter, this portion of the survey led with a broad question about whether the public thinks social media reflects overall public sentiment. On this score, a majority of Americans (74%) think the content people post on social media does not provide an accurate picture of how society feels about important issues, while one-quarter say it does. Certain groups of Americans are more likely than others to think that social media paints an accurate picture of society writ large. Notably, blacks (37%) and Hispanics (35%) are more likely than whites (20%) to say this is the case. And the same is true of younger adults compared with their elders: 35% of 18- to 29-year-olds think that social media paints an accurate portrait of society, but that share drops to 19% among those ages 65 and older. Still, despite these differences, a majority of Americans across a wide range of demographic groups feel that social media is not representative of public opinion more broadly. When asked about six different emotions that they might experience due to the content they see on social media, the largest share of users (88% in total) say they see content on these sites that makes them feel amused. Amusement is also the emotion that the largest share of users (44%) frequently experience on these sites. Social media also leads many users to feel anger. A total of 71% of social media users report encountering content that makes them angry, and one-quarter see this type of content frequently. Similar shares say they encounter content that makes them feel connected (71%) or inspired (69%). Meanwhile, around half (49%) say they encounter content that makes them feel depressed, and 31% indicate that they at least sometimes see content that makes them feel lonely. Identical shares of users across a range of age groups say they frequently encounter content on social media that makes them feel angry. But other emotions exhibit more variation based on age. 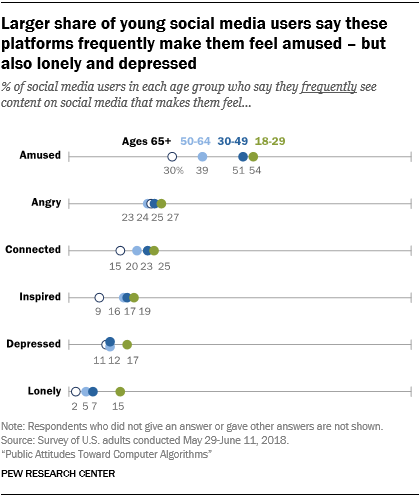 Notably, younger adults are more likely than older adults to say they frequently encounter content on social media that makes them feel lonely. Some 15% of social media users ages 18 to 29 say this, compared with 7% of those ages 30 to 49 and just 4% of those 50 and older. Conversely, a relatively small share of older adults are frequently amused by content they see on social media. In fact, similar shares of social media users ages 65 and older say they frequently see content on these platforms that makes them feel amused (30%) and angry (24%). A recent Pew Research Center analysis of congressional Facebook pages found that the “anger” emoticon is now the most common reaction to posts by members of Congress. And although this survey did not ask about the specific types of content that might make people angry, it does find a modest correlation between the frequency with which users see content that makes them angry and their overall political affiliation. Some 31% of conservative Republicans say they frequently feel angry due to things they see on social media (compared with 19% of moderate or liberal Republicans), as do 27% of liberal Democrats (compared with 19% of moderate or conservative Democrats). 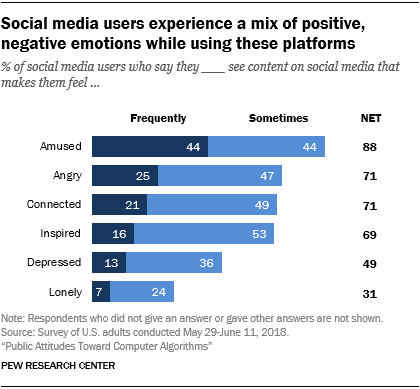 Along with asking about the emotions social media platforms inspire in users, the survey also included a series of questions about how often social media users encounter certain types of behaviors and content. 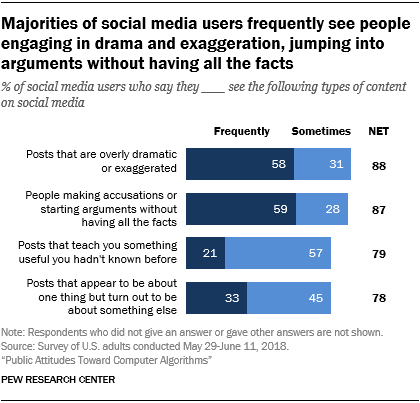 These findings indicate that users see two types of content especially frequently: posts that are overly dramatic or exaggerated (58% of users say they see this type of content frequently) and people making accusations or starting arguments without waiting until they have all the facts (59% see this frequently). A majority of social media users also say they at least sometimes encounter posts that appear to be about one thing but turn out to be about something else, as well as posts that teach them something useful they hadn’t known before. But in each instance, fewer than half say they see these sorts of posts frequently. Beyond the emotions they feel while browsing social media, users are exposed to a mix of positive and negative behaviors from others. Around half (54%) of social media users say they typically see an equal mix of people being kind or supportive and people being mean or bullying. Around one-in-five (21%) say they more often see people being kind and supportive on these sites, while a comparable share (24%) says they more often see people being mean or bullying. Previous surveys by the Center have found that men are slightly more likely than women to encounter any sort of harassing or abusive behavior online. And in this instance, a slightly larger share of men (29%) than women (19%) say they more often see people being mean or bullying content on social media platforms than see kind behavior. Women, on the other hand, are slightly more likely than men to say that they more often see people being kind or supportive. But the largest shares of both men (52%) and women (56%) say that they typically see an equal mix of supportive and bullying behavior on social media. When asked about the efforts they see other users making to spread – or correct – misinformation, around two-thirds of users (63%) say they generally see an even mix of people trying to be deceptive and people trying to point out inaccurate information. Similar shares more often see one of these behaviors than others, with 18% of users saying they more often see people trying to be deceptive and 17% saying they more often see people trying to point out inaccurate information. 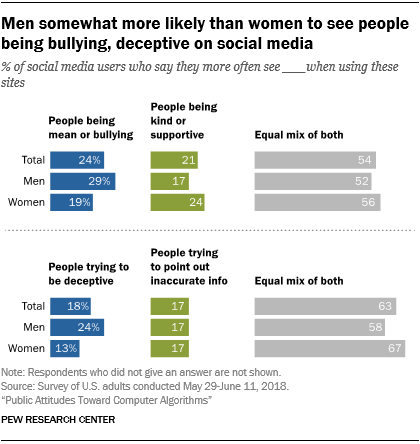 Men are around twice as likely as women to say they more often seeing people being deceptive on social media (24% vs. 13%). But majorities of both men (58%) and women (67%) see an equal mix of deceptiveness and attempts to correct misinformation. The vast quantities of data that social media companies possess about their users – including behaviors, likes, clicks and other information users provide about themselves – are ultimately what allows these platforms to deliver individually targeted content in an automated fashion. And this survey finds that users’ comfort level with this behavior is heavily context-dependent. They are relatively accepting of their data being used for certain types of messages, but much less comfortable when it is used for other purposes. Three-quarters of social media users find it acceptable for those platforms to use data about them and their online behavior to recommend events in their area that they might be interested in, while a smaller majority (57%) thinks it is acceptable if their data are used to recommend other people they might want to be friends with. On the other hand, users are somewhat less comfortable with these sites using their data to show advertisements for products or services. Around half (52%) think this behavior is acceptable, but a similar share (47%) finds it to be not acceptable – and the share that finds it not at all acceptable (21%) is roughly double the share who finds it very acceptable (11%). 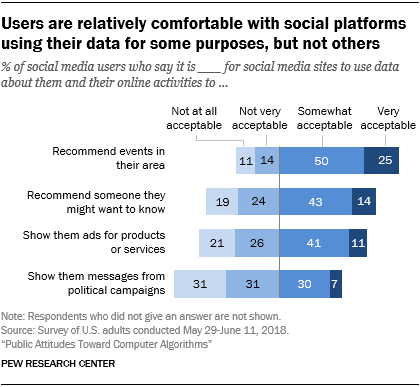 Meanwhile, a substantial majority of users think it is not acceptable for social media platforms to use their data to deliver messages from political campaigns – and 31% say this is not acceptable at all. Relatively sizable majorities of users across a range of age groups think it is acceptable for social media sites to use their data to show them events happening in their area. 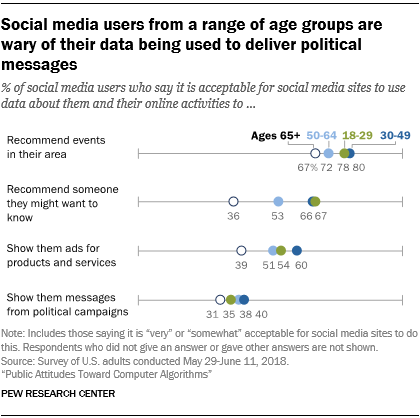 And majorities of users across a range of age categories feel it is not acceptable for social platforms to use their data to serve them ads from political campaigns. But outside of these specific similarities, older users are much less accepting of social media sites using their data for other reasons. This is most pronounced when it comes to using that data to recommend other people they might know. By a two-to-one margin (66% to 33%), social media users ages 18 to 49 think this is an acceptable use of their data. But by a similar 63% to 36% margin, users ages 65 and older say this is not acceptable. Similarly, nearly six-in-ten users ages 18 to 49 think it is acceptable for these sites to use their data to show them advertisements for products or services, but that share falls to 39% among those 65 and older. Beyond using their personal data in these specific ways, social media users express consistent and pronounced opposition to these platforms changing their sites in certain ways for some users but not others. Roughly eight-in-ten social media users think it is unacceptable for these platforms to do things like remind some users but not others to vote on election day (82%), or to show some users more of their friends’ happy posts and fewer of their sad posts (78%). And even the standard A/B testing that most platforms engage in on a continuous basis is viewed with much suspicion by users: 78% of users think it is unacceptable for social platforms to change the look and feel of their site for some users but not others. Older users are overwhelmingly opposed to these interventions. But even among younger users, large shares find them problematic even in their most common forms. For instance, 71% of social media users ages 18 to 29 say it is unacceptable for these sites to change the look and feel for some users but not others.